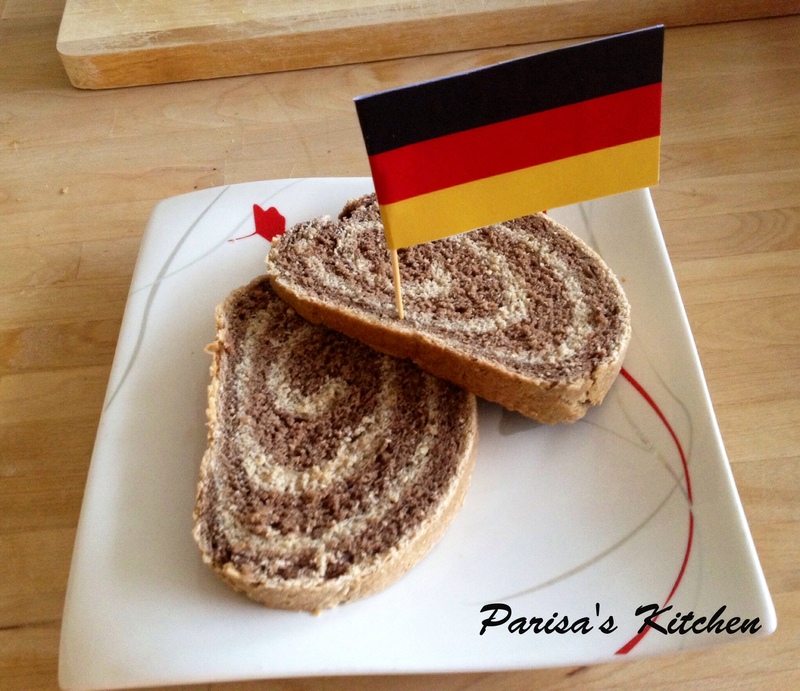 Today’s recipe is another well known German bread: pumpernickel. I hadn’t tried this bread before, and its funny name was always intriguing to me 😀 So I gave baking it a go and I was impressed by how tasty it was! I thought I make it a bit different, and so I made a marbled loaf of pumpernickel. If it looks like it takes a lot of work, it really doesn’t! 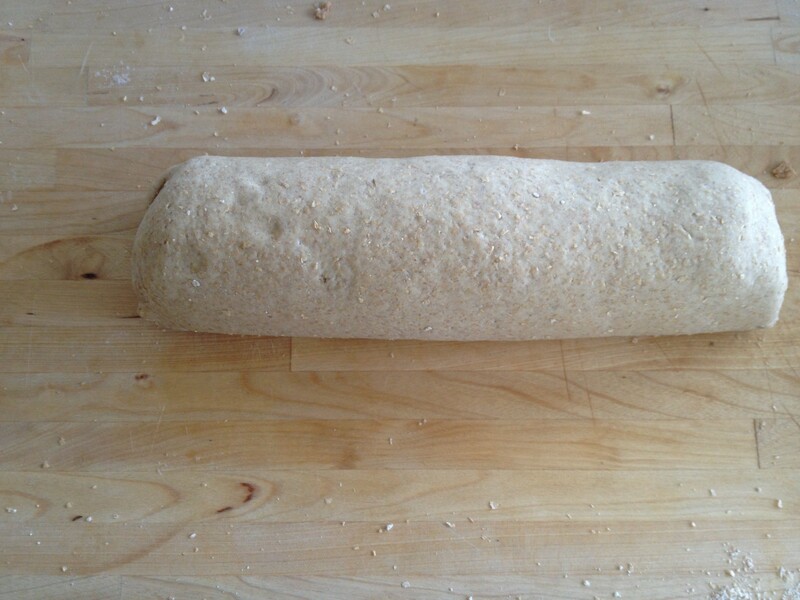 You just need to make two bread doughs and before the final rise, just roll up the doughs together (similar to baking a Swiss roll). 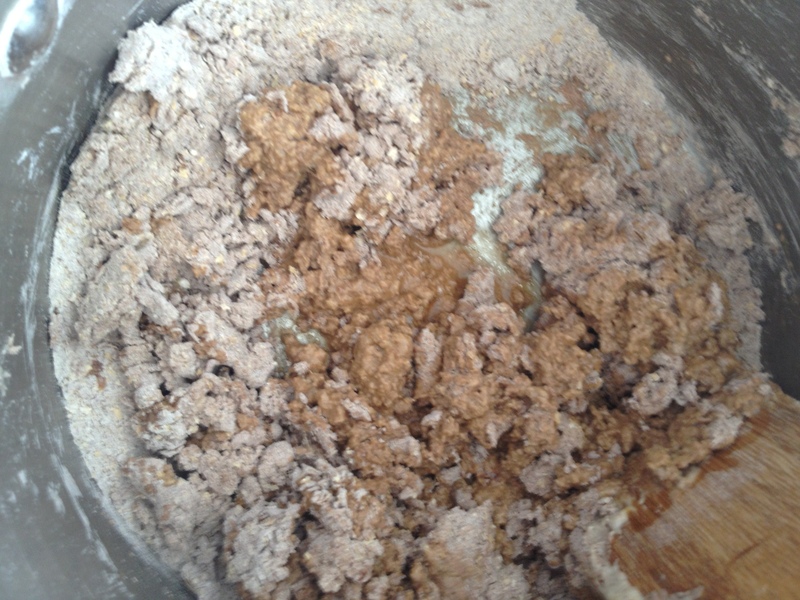 The methods of making both doughs are the same. 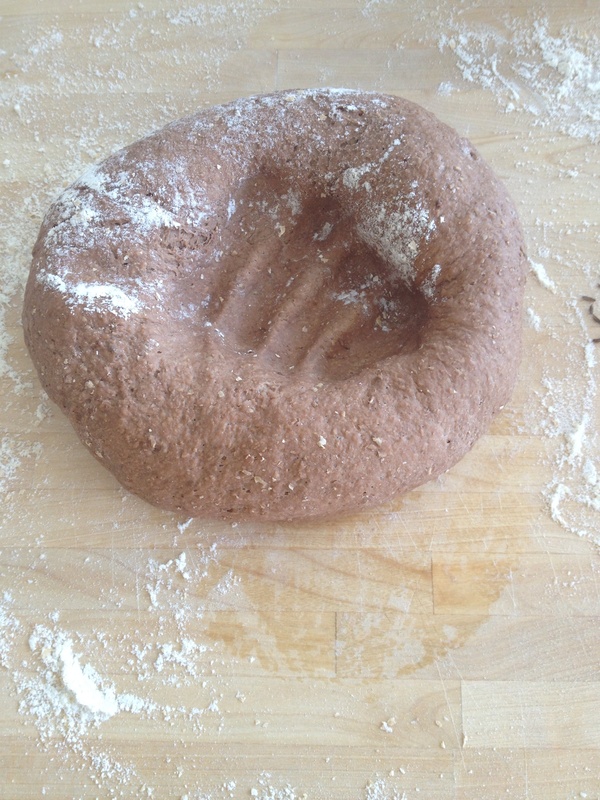 For dough 2, there are no coffee powder, espresso powder and caraway seeds, so you just skip those ingredients. 1. 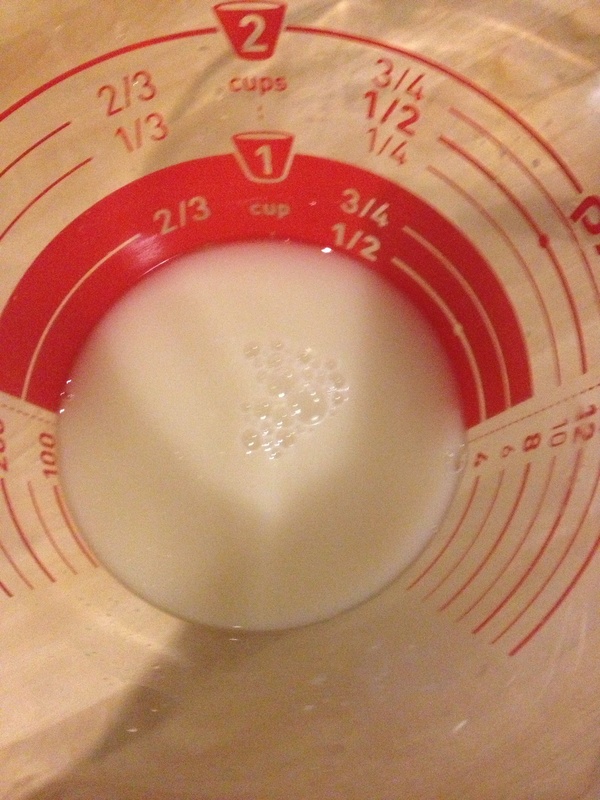 Starter: dissolve the yeast in 100 ml warm water. 3. 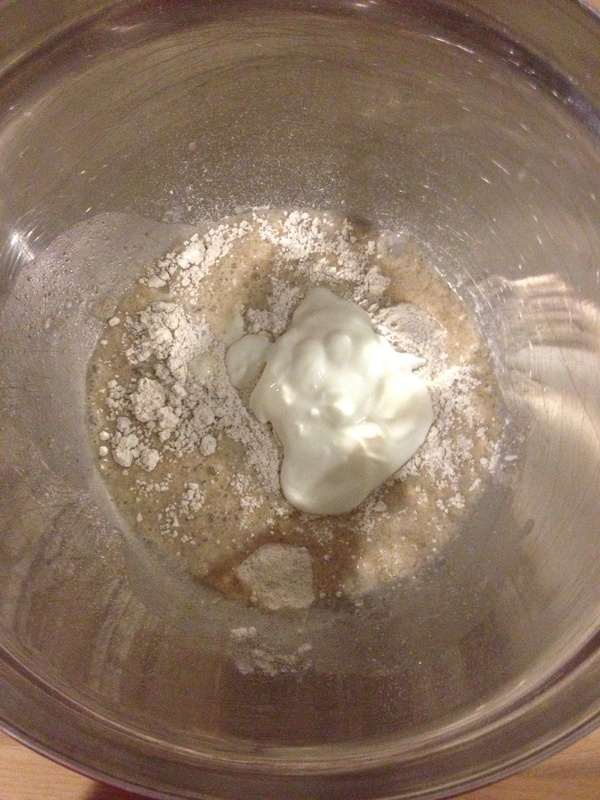 For the main dough: dissolve the yeast in 4 tablespoons of warm water. 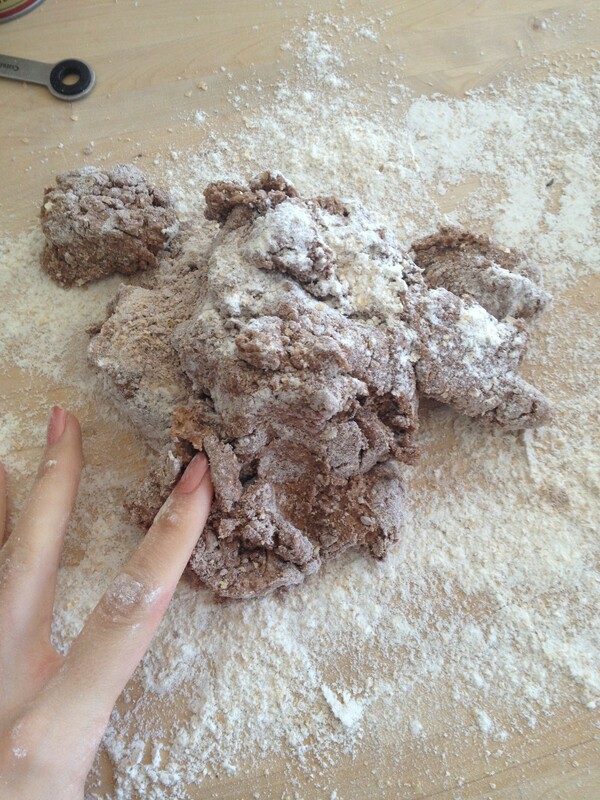 Add coffee powder (if present), and stir to dissolve. Add the oil and stir. 4. 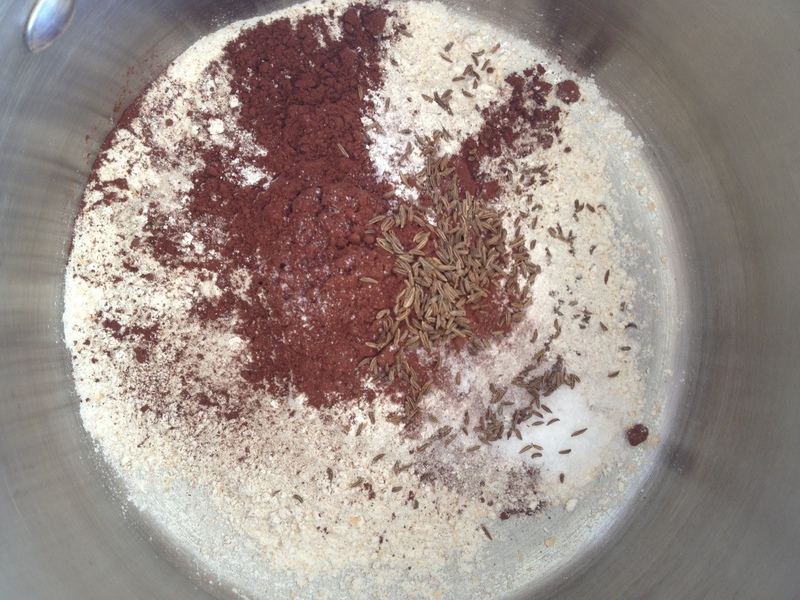 Place the starter, flours, cocoa powder (if present), and caraway seeds (if present) in a large bowl. 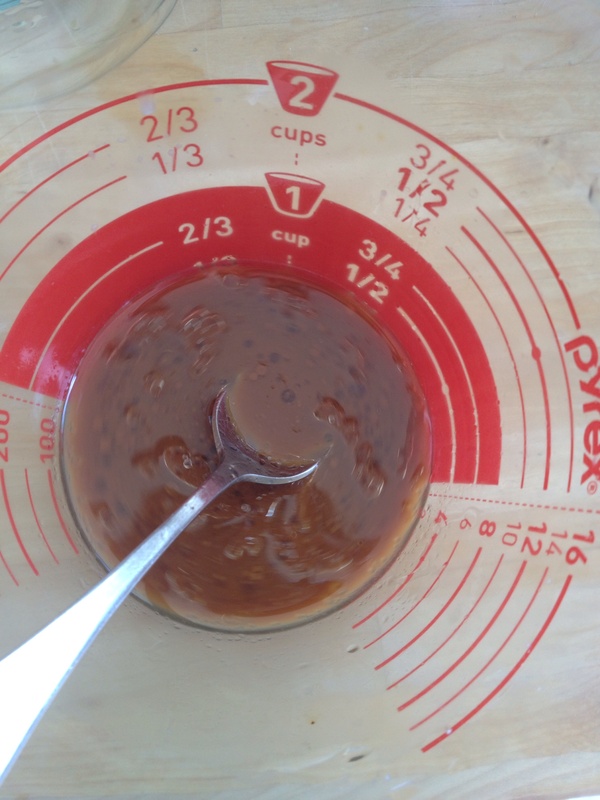 Then add the liquid yeast mixture. 5. 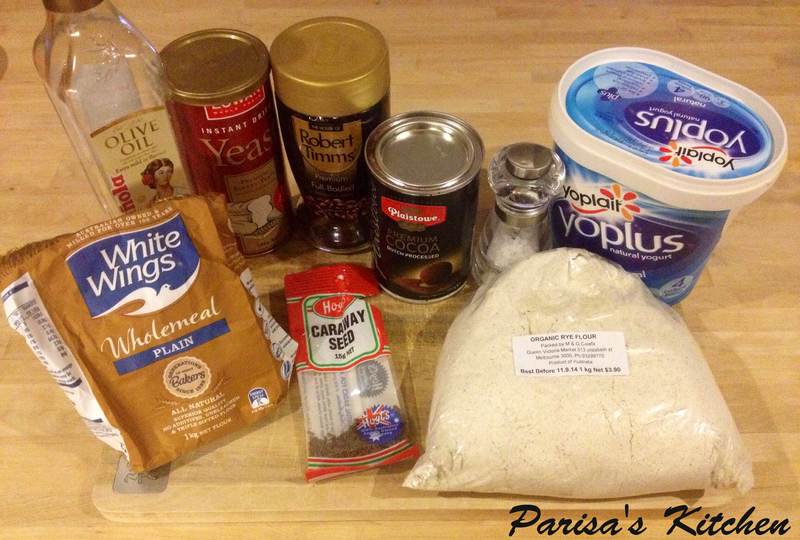 Mix the ingredients to make a rough dough. 6. 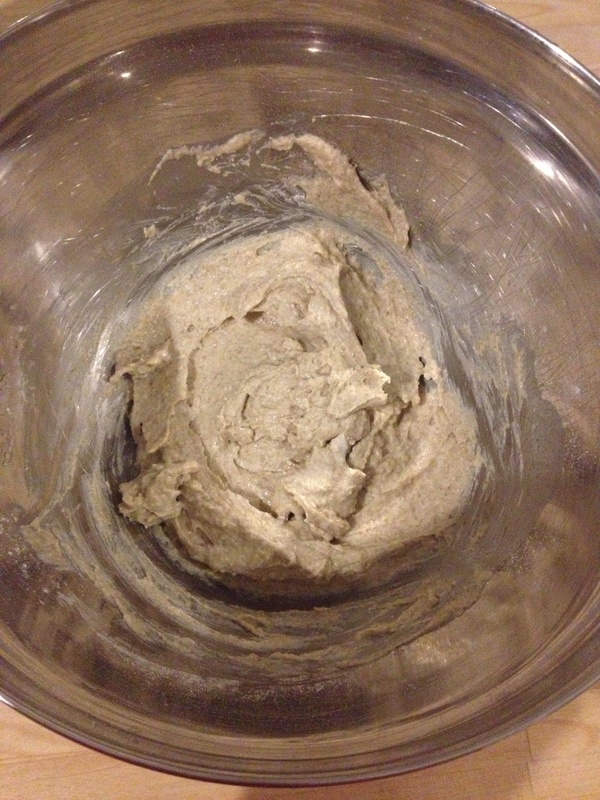 Transfer to a floured surface and knead for 10 minutes, until it is smooth and elastic. 7. 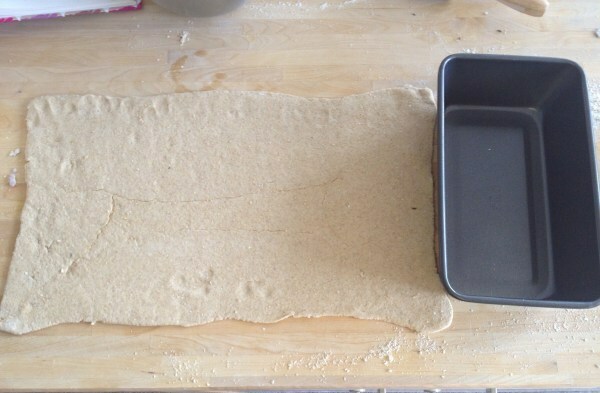 Place the dough in a lightly oiled bowl, covered, and leave to rise in a war place for a maximum of 2 hours, or until doubled in size. 8. 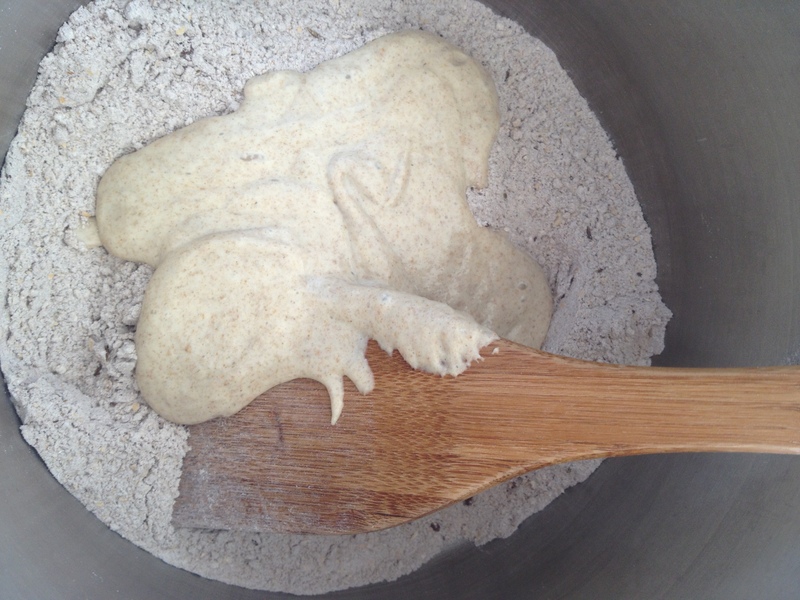 Turn the dough to a floured surface and gently knock it back. 9. Shape into a ball, put it back in the bowl and let rise again for 1 hour. 10. 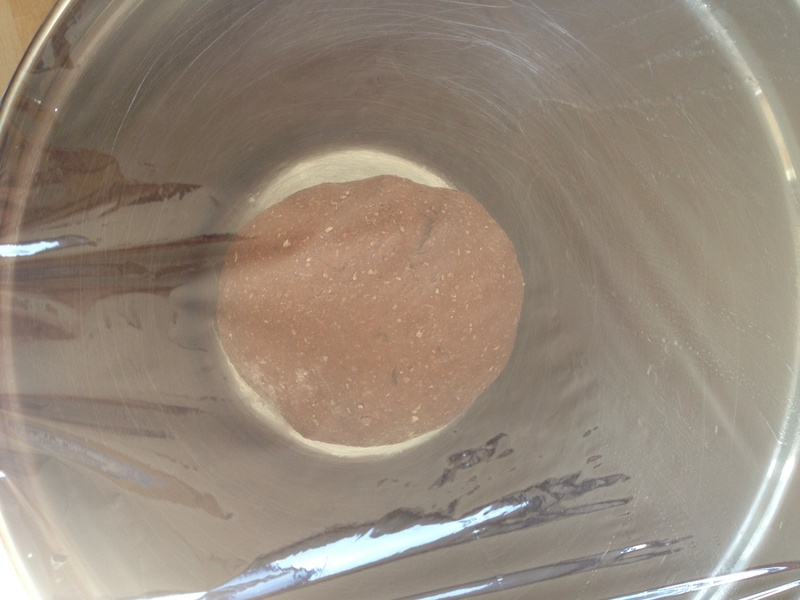 Turn the dough onto a floured surface, and knock it back again. 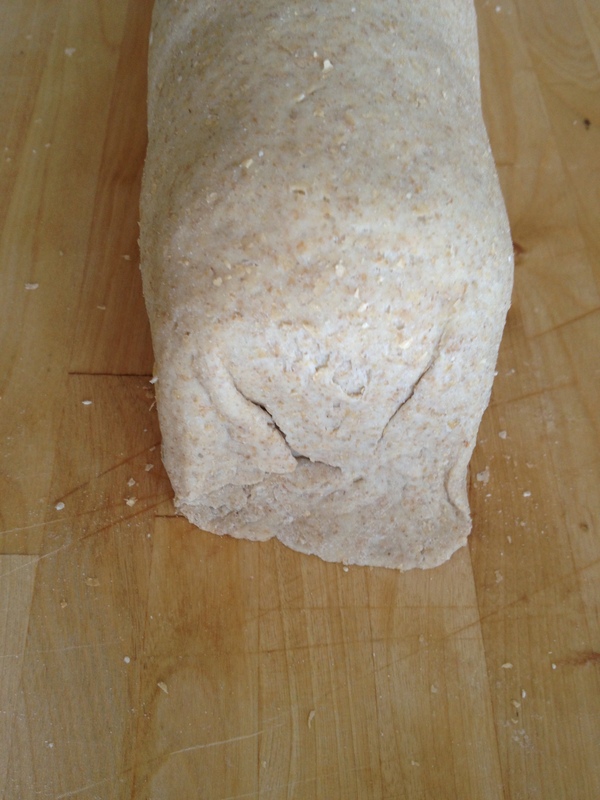 Knead it for a minute, then make it into a large rectangular shape. 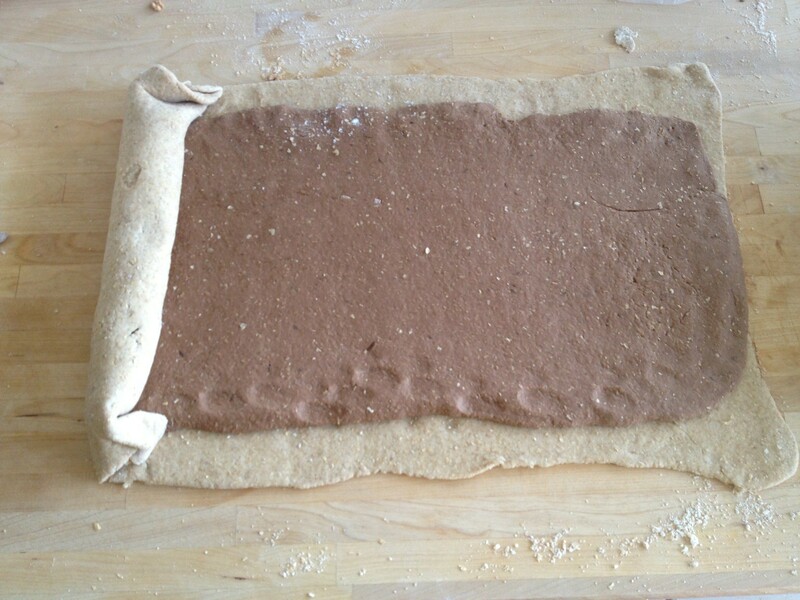 For the chocolate/coffee dough: make it slightly smaller than the plain dough, leaving a 1 cm gap around the edges of plain dough. 11. 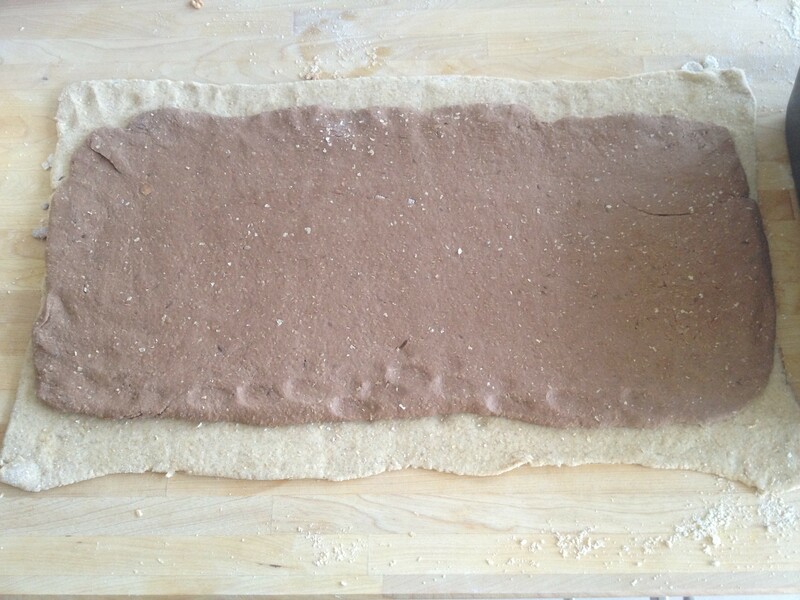 Place the chocolate/coffee dough on top of the plain dough. 12. Start rolling the doughs together. Tuck the ends in as you go. 13. 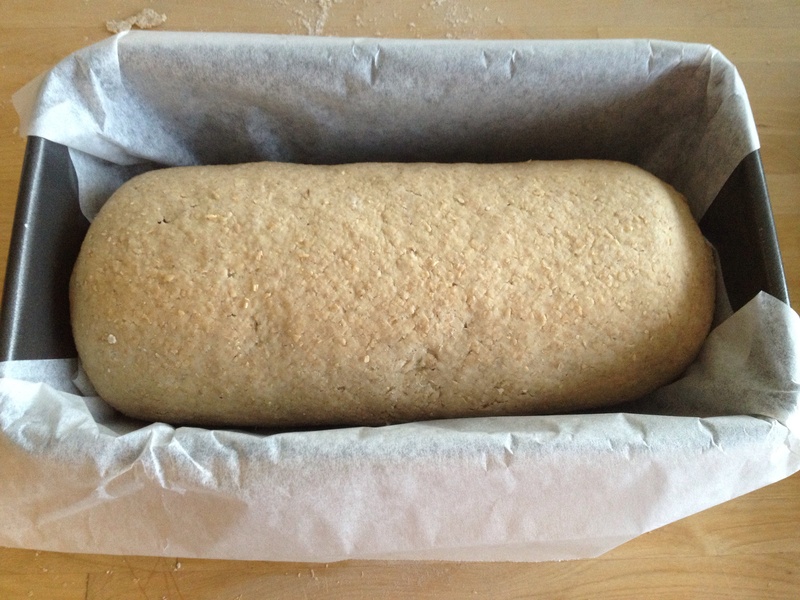 Place the final bread dough into a loaf tom, lined with baking paper, and let rise for the final time, covered, for another 1.5 hours, until almost doubled in size. 14. Preheat the oven to 200 degrees. 15. Bake in oven for about 30 minutes, BE CAREFUL IN THE FINAL MINUTES: when the bread sounds hollow when tapped on top, it is done. 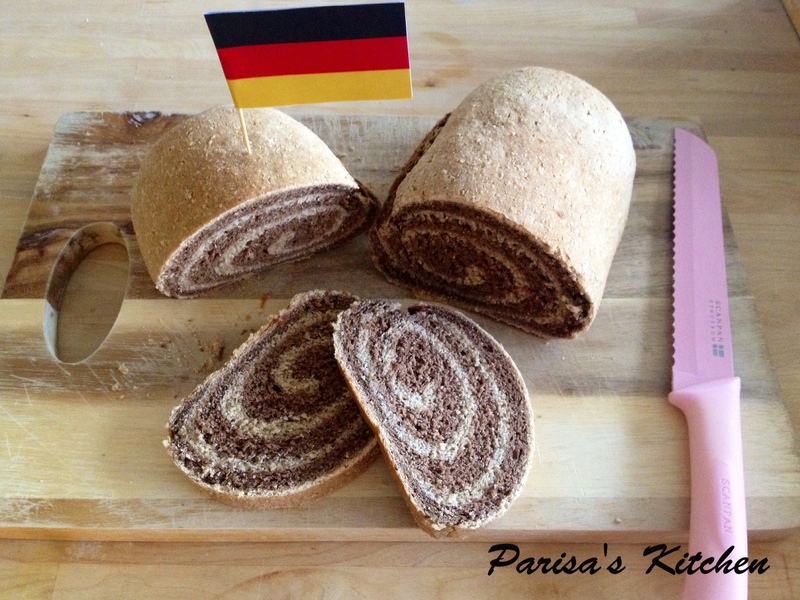 Posted in Bread, GermanTagged baking, bread, caraway, chocolate, cocoa, coffee, espresso, German, healthy, loaf, marble, marbled, pumpernickel, rye, wholemealBookmark the permalink. Wow that looks so unique and delicious too. I don’t know if I have the patience to craft it like that but I would love to taste it, given a chance. Thanks for sharing! wow, so that’s how it works! kind of like the zebra cake. I’m impressed. You did a beautiful job! The bread looks just so and just perfect. It looks like a chocolate cake, fresh and soft for breakfast. It dose not look like bread at all. An attractive appearance to entice whoever is not into bread, to have a piece of it. It is so popular around the world as it looks chic and elegant. Thank you for telling the secret of how you have done it so perfect.Well done. 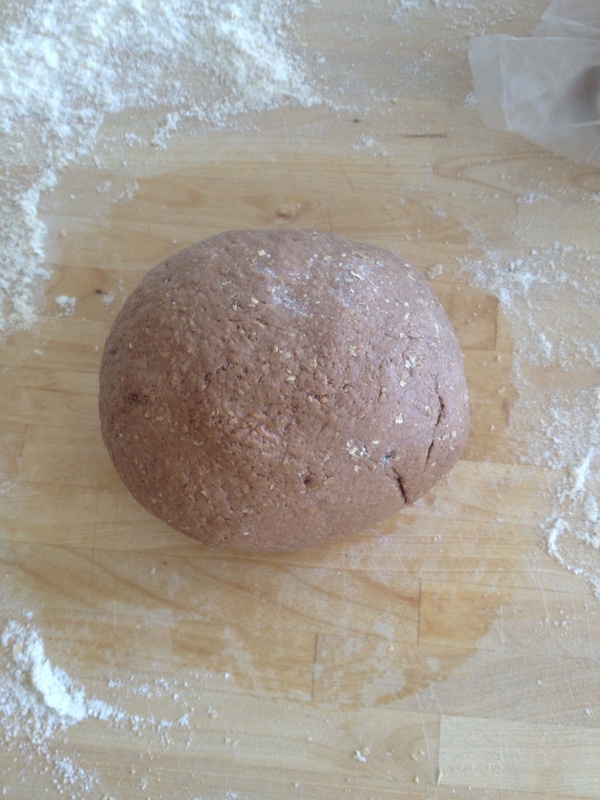 Your pumpernickel bread looks awesome ! I don’t bake bread or brioche very often…maybe I’m not as patient as you are !! Have a nice week, Parisa ! Thanks a lot Sylvie! 🙂 you know sometimes when I don’t have the time(or patience! ), I just bake a no-knead wholemeal loaf, you just mix all of the ingredients in one bowl and let rise for half an hour and then straight in oven!let me know if you’d like to know the recipe and I’ll post it 😉 have a lovely day ! Sure, I’d love to know it ! I really like your bread recipes ! Have a nice day ! There are few things in life that I enjoy more than freshly baked bread and this looks superb! I’ve always been intimidated to bake fresh bread and I don’t even know why! I’ve put this on my short list to make for sure and I’ve also nominated you for the Liebster award! Thank you so much for your lovely comments. I’m glad that you enjoyed my post! I am so honored and excited that you’ve nominated me, I can not put it in words! I love blogging and knowing that I have readers out there in different corners of the world who enjoy my posts as well, is just the cherry on top of the cake! Being a novice blogger, I read the rules of this award on your blog and will publish a post following them tomorrow. Do you have any questions for me? I will definitely be making this one but first I have to lose a few pounds because I know what would happen! I’ve never tried a bread with coffee and cocoa before. I’m sure it’s delicious like your other recipes.